High temperatures can be used to destroy tumor cells, a cancer treatment known as hyperthermic oncology. Although the idea behind this treatment method has been around for some time, it wasn’t until recently that new tools and more precise delivery of heat has allowed hyperthermia to be used for cancer treatment. As hyperthermic oncology studies continue, simulation has proven a valuable tool for achieving a deeper understanding of how to deliver heat to tumors while limiting damage to healthy tissue. 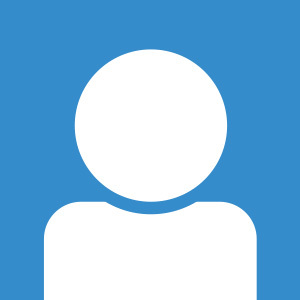 How Is Hyperthermia Used to Treat Cancer? There are two different ways in which hyperthermia can be used to treat cancer. The first is called local hyperthermia or thermal ablation, and it is used to treat a small area of cells, such as a tumor. This treatment is more successful when used to treat tumors that are located on or near the skin’s surface. In these treatments, the area is generally heated to temperatures between 40 and 45°C (104 to 113°F). The second type is called regional hyperthermia, and it uses low heat to elevate the temperature of a region of the body, such as a limb or organ. Generally, the temperature isn’t hot enough to destroy tissues, but it is instead combined with chemotherapy or radiation to make these treatments more effective. Currently, hyperthermic oncology treatments are still undergoing extensive experimental testing. The procedure is only offered in a few treatment centers around the world. Because measuring the temperature inside a tumor is difficult, it is hard to ensure that the area being treated is kept within the exact temperature range needed over a precise period of time, without affecting surrounding tissues. This is where simulation is proving to be a powerful tool. It can be used to study the responses of different tissue types to hyperthermia, to determine the temperatures reached within a tumor, and to help decide the optimal design and placement of temperature sensors. 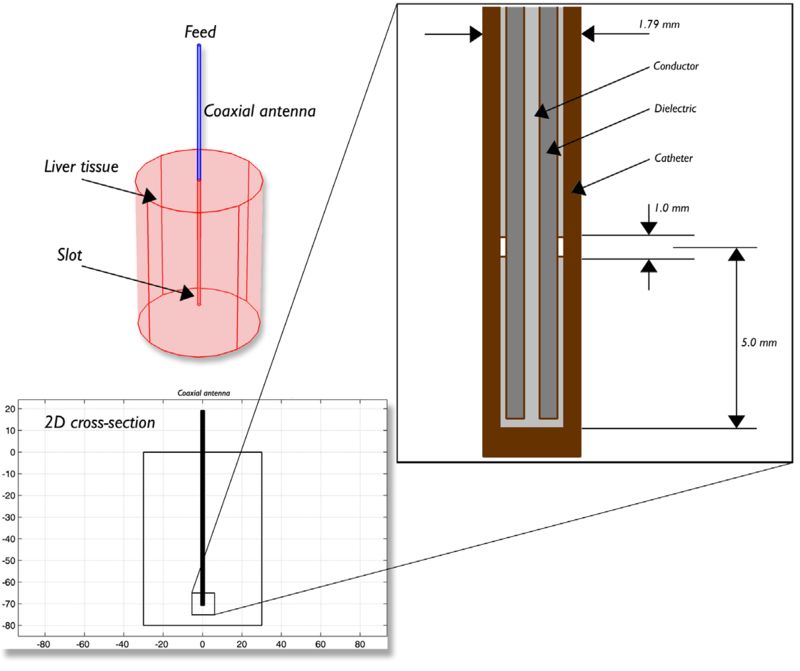 Let’s take a look at a model of a local hypthermia treatment method that uses microwave coagulation to heat a tumor by inserting an antenna into it. This method is most commonly used to treat hepatocellular carcinoma (small size liver tumors). The microwaves heat up the tumor and create a coagulated area where the cancer cells are destroyed. The model example takes into account the temperature distribution, radiation, and specific absorption rate (SAR) in liver tissue. The model geometry, which was based off of the paper by Saito et al., is shown below. The model is composed of liver tissue, the antenna from which the microwave coagulation is delivered, and a ring shaped slot that serves to increase the size of the coagulated region in the liver tissue. Antenna geometry for microwave coagulation therapy. A coaxial cable with a ring-shaped slot cut on the outer conductor is short-circuited at the tip. A plastic catheter surrounds the antenna. Since the model contains rotational symmetry, the computational domain can be represented in 2D using cylindrical coordinates. Because of the computation time saved by modeling in 2D, a fine mesh can be selected, which will provide very accurate results. In the model, the metallic parts of the antenna and slot have been modeled as boundaries. Heat transfer has been modeled in the liver domain and insulation is used where the domain ends. 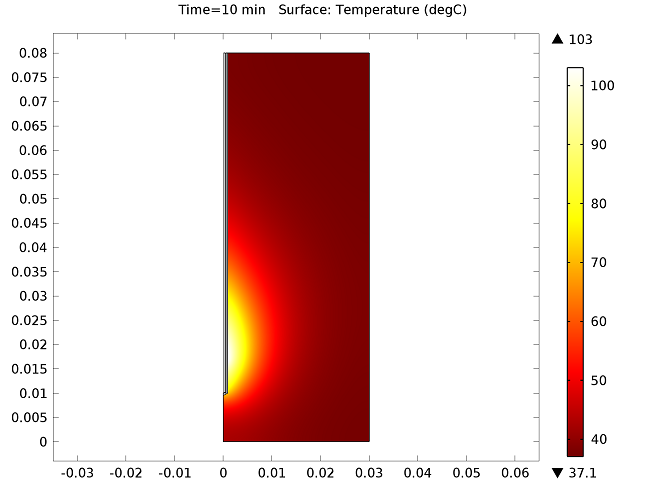 In addition to analyzing heat transfer, the simulation also gives an idea about the degree of tissue injury during the procedure, as computed by the Arrhenius equation. The model assumes that blood enters the liver at 37°C. The figure below show the results of the temperature distribution in the liver tissue for a microwave input power of 10 W after 10 minutes. The temperature is highest near the antenna and decreases with distance, reaching 37°C near the outer regions of the domain (top image). It appears that the relatively cool temperature of the blood limits the region of tissue that is heated. 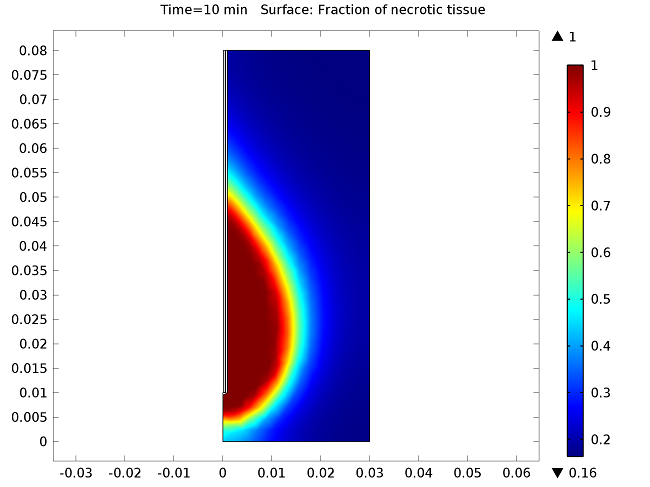 The image on the bottom shows the fraction of necrotic tissue. Temperature in the liver tissue (top) and the fraction of necrotic tissue (bottom). 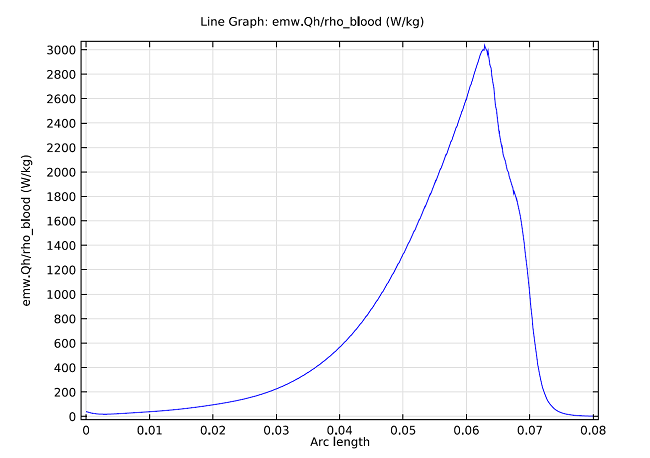 The model can also compute the SAR value within the liver, where the graph below shows it computed along a line parallel to the antenna and at a distance 2.5 mm from the antenna’s axis. SAR value in W/kg along a line parallel to the antenna and at a distance 2.5 mm from the antenna axis. The tip of the antenna is located at 70 mm, and the slot is at 65 mm. Clinical trials have shown that hyperthermia treatment significantly increases the effectiveness of radiotherapy and chemotherapy. However, there are two major complications that make treatment with hypothermia a challenge: the ability to precisely determine the temperature within the tumor, and the ability to ensure that a uniform temperature is achieved within the desired area. However, advances in tools for both heat delivery and temperature monitoring are promising for the future of hyperthermia treatments. Advancements in computational techniques have also played a role in its development. In addition to providing more accurate information on how to design, optimize, and implement hyperthermia treatments, simulation is also being used to developed personalized hyperthermia treatments and planning. Current studies continue to rely on simulation to better understand, improve, and personalize hyperthermic oncology.